Grace Poe, Leni Robredo, Karen Davila, and other Filipina entrepreneurs tell their mostly young audience to be financially independent and entrepreneurial to sustain themselves. 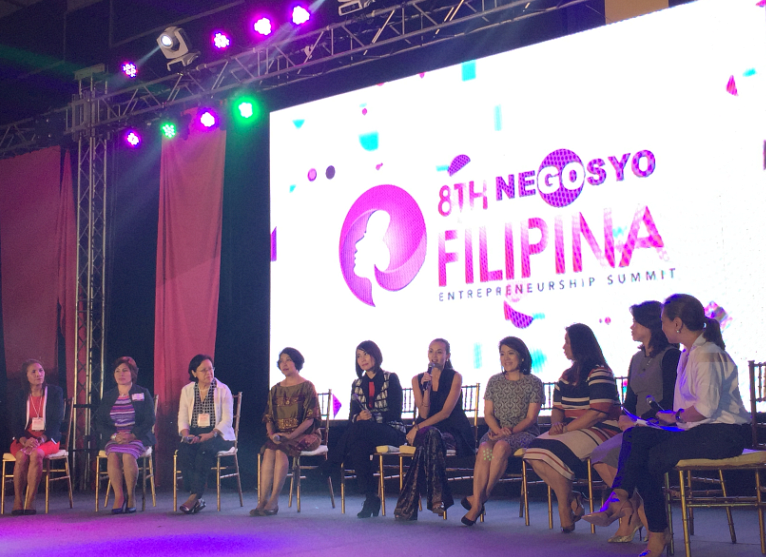 MANILA, Philippines – Female business leaders and other prominent personalities shared their lessons learned to aspiring entrepreneurs at the 8th Filipina Entrepreneurship Summit held at the World Trade Center Pasay City on Thursday, February 18. More than 9000 participants attended the summit, from about 200 schools and 75 organizations nationwide. With the theme, “Building Inclusive and Innovative Enterprise,” speakers championed the power of business education, digital connectivity, and hard work in entrepreneurship. 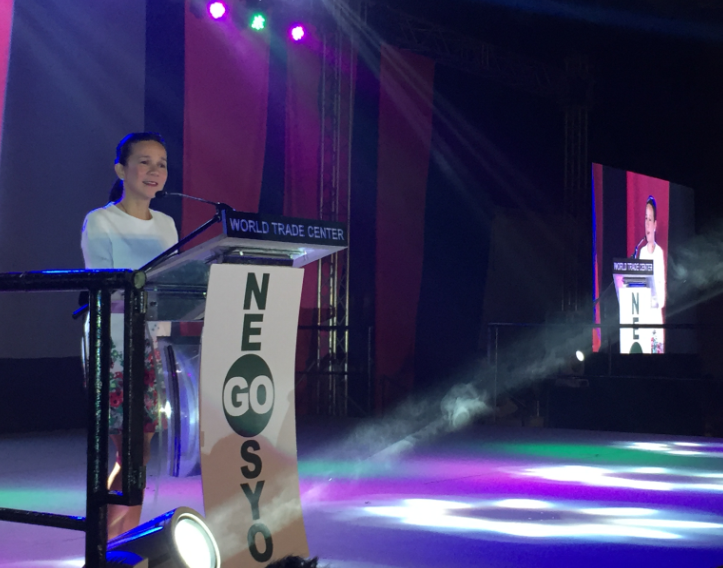 Presidential aspirant Senator Grace Poe opened the day-long activities and emphasized financial independence of women in families, and headlined her proposals for micro, small, and medium enterprises (MSMEs) if ever elected. “It’s important women have their own income, from wives to single mothers, you must be able to sustain yourself independently without the aid of you partners,” Poe said in Filipino. Even if 99% of businesses in the country are comprised by MSMEs, there is still little help from the government, thus the need for measures to help them grow, Poe said. She mentioned adding and expanding Negosyo Centers nationwide, including TESDA (Technical Education and Skills Development Authority) Women Training centers to help local communities. “All academic institutions and colleges should have fast WiFi. Same with entrepreneurs, a fast Internet connection—anywhere they may be in the country—will let them compete with other businesses worldwide,” Poe added. Some of the honorees are Aranaz Bags and SoFA Design Institute founder Amina Aranaz; Ted’s Old Timer La Paz Batchoy's Adelfa Borro; The North Road Image and Fashion Group’s Delby Bragais; and Benby Enterprises Inc.’s Evelyn Lao-Yap. Social entrepreneur Cristina Liamzon, Kythe’s Foundation Fatima Lorenzo, and Rossana Leanado of AHEAD Learning System were also awarded. Nata de Coco manufacturer Lydia Malot; educator Rowena Matti; Oryspa founder Sherill Quintana; Leather Collection Inc.’s Yolanda Sevilla; The Moment Group of Restaurant’s Abba Napa were also honored. Viana Food Condiments’ Teresita Valdez; Josiah’s Catering Judith Versoza; educator Elizabeth Lahoz; and Sunnies Studios founders Martine Cajucom, Bea Soriano-Dee, and Georgina Wilson completed the list of honorees. 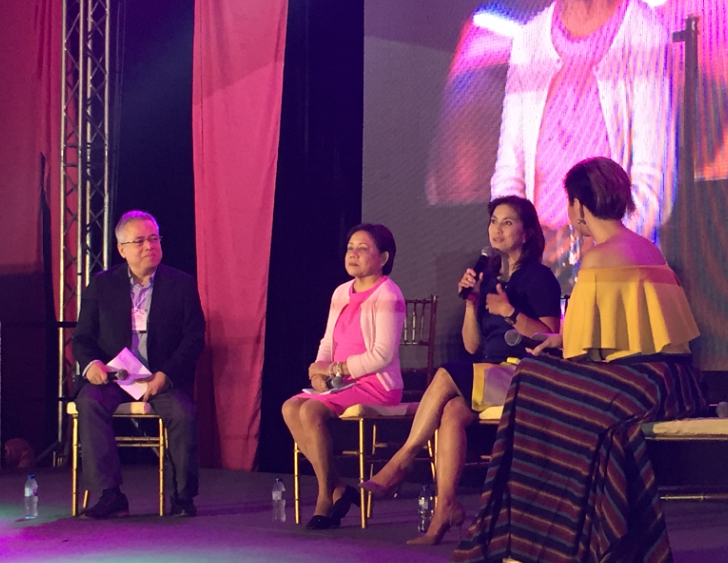 In a forum moderated by ABS-CBN news anchor Karen Davila, some of the honorees shared their own success stories and how they can be emulated by aspiring businesswomen. For international brand Oryspa’s founder Quintana, gaining experience first develops discipline which could translate to better work ethic as an entrepreneur. For the event’s first keynote forum, Senator Cynthia Villar and Liberal Party’s vice presidential bet and Camarines Sur Representative Leni Robredo headed the panel, who talked about how women and the youth can help their families through entrepreneurship and the government’s response for such call. “I’ve handled multiple cases of battered wives before as a human rights lawyer, who couldn’t leave their husbands due to lack of financial independence. That shouldn’t be the case. You must be able to stand up on your own without fully depending on your spouse,” Robredo said. Still, the government’s initiatives will not be enough if its constituents accept the help as beneficiaries. “Help will be unsustainable if constituents would always just wait for help, then start bickering when it stops. They should be treated as partners of development. They know they should do their part to succeed,” Robredo added. Other notable women in local media also graced the event. Inquirer Group of Companies President Sandy Prieto-Romualdez talked about the Philippine Daily Inquirer’s story and how it has shaped history. Elyssa is Entrepreneur.com.ph’s editorial assistant / staff writer. Follow her on Twitter, @elyssalopz. How many bodyguards are protecting Mark Zuckerberg's 5-bedroom mansion?